It’s time for Mumbling Monday! I made a bad buy. 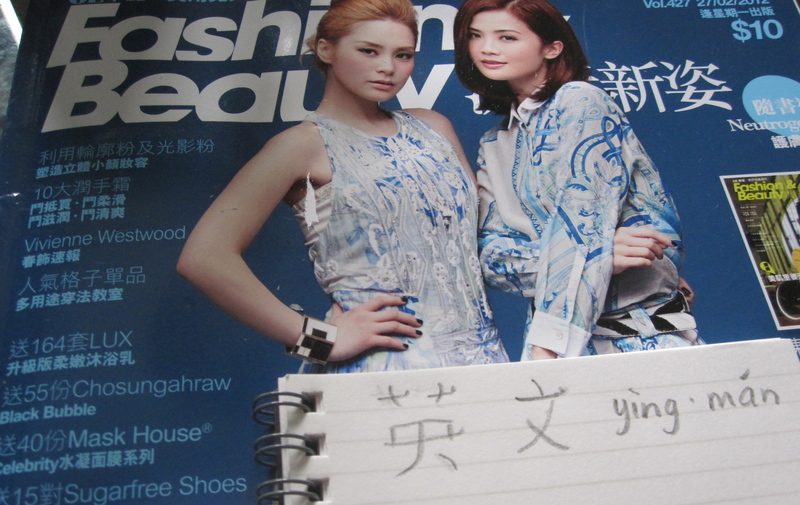 I attempted to purchase a magazine that I thought was in English as well as in Cantonese. That way maybe, just maybe, I could view the two languages side by side. Seemed like a solid pick of a magazine, but it was sealed in plastic so there was no way to know what I was getting myself into. Of course I was wrong. At least the pictures are pretty. The kind magazine stand dude said, “No, Ying Mon.”, and pointed out where the English magazines are. I’m still unsure if I can get a magazine with the language paired, but I’m guessing no. * I don’t know what I was thinking, we all know that the French Vogue is different from the American Vogue, it’s not just the same content in different languages. DOH! According to my guide-book you can say something eloquent, “Naw seek gawn ying mon”**, which means “I speak English” but “Ying Mon” works just as well if you say it with a smile. *** Next time I will know. Thanks for tuning into Mumbling Monday! * If you know if I can get dual language magazines, please let me know! That would be so rad! ** This is my non-official attempt at pronunciation. *** This is my personal theory, and I am not sure if this applies in Hong Kong, but it has worked so far.